Every once in a while, I’ll get into a discussion with someone about what sort of music is and is not appropriate as part of a church service. One of the groups I regularly attend with plays contemporary Christian and Messianic music, the other only sings songs out of their custom hymnal. And there’s quite a bit of variety in other groups as well, from a capella psalm singing to rocking worship bands. I’m not going to say any of these musical traditions is “wrong” or “more right,” but I did notice something interesting about music when I was studying prophecy last week. One criticism that I’ve heard hymn singers level against those who sing more up-beat songs is that it’s too focused on emotion. You can’t “welcome the spirit of God” through music, they say. The music should be respectful and instructive. Worship’s not about making you feel God’s presence. Or is it? Early in Elisha’s ministry as a prophet, three kings came to ask him a question. They were planning to attack Moab, but ran out of water and wondered if their venture was doomed. King Jehoshaphat of Judah suggested inquiring of a prophet of the Lord. Once Elisha agreed to help, he makes what might seem like an odd request. This is exactly what it sounds like — a prophet asking for a musician to play while he listens for God’s voice. The word “minstrel” refers to someone beating or thrumming a tune, typically on a stringed instrument (Strong’s H5059). The connection between music and speaking under the inspiration of God is found elsewhere as well. The Hebrew word for “prophetess” can also mean “poetess” (Strong’s H5031). Miriam is called a prophetess when she leads the women of Israel in song and dance (Ex. 15:20-21). The prophetess Deborah wrote a song that takes up an entire chapter (Judges 5:1-31). And it wasn’t just the women. The greatest songwriter in the Bible, King David, is called a prophet by Peter when he quotes one of his psalms (Acts 2:29-31). Scripture teaches us that music is important to God. He will inspire it and He wants us to use it. His people have been singing to Him at least as far back as Exodus (see chapter 15). Later, he used David to formally add music to the temple services (1 Chr. 6:31; 15:16, 22; 25:6-7; Neh. 12:45-46) and it’s been a core part of Hebraic and now Christian worship ever since. Paul even mentions music’s importance to the church in two of his letters. Like other utterances inspired by God, singing to Him happens under influence of His spirit. That’s not to say all music is inspired by God, but music can be. And it’s not something the church is meant to stifle. It’s meant to be used. 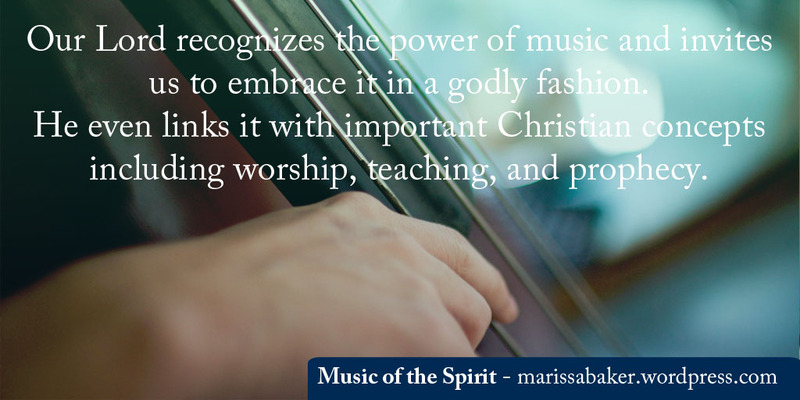 Our Lord recognizes the power of music and invites us to embrace it in a godly fashion. Use music in your church services. Sing songs to God on your own (and if you think you can’t sing, there’s always the option to “make a joyful noise“). 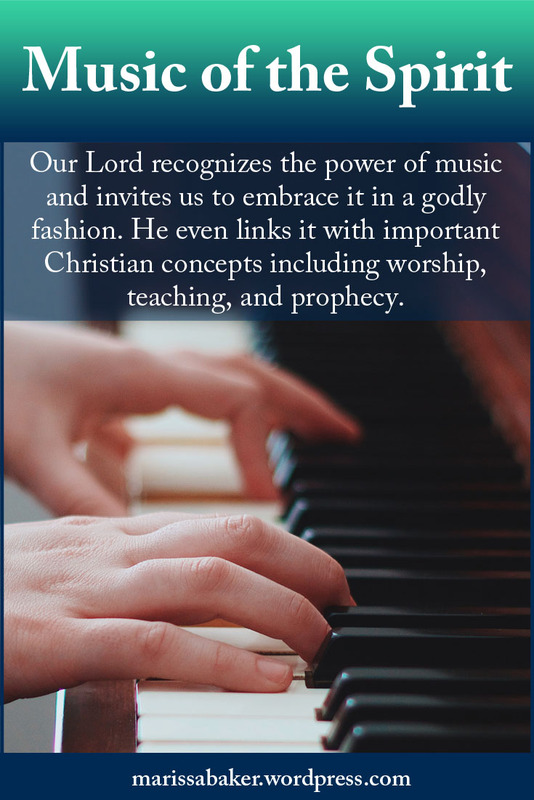 We can use music to help us draw into God’s presence, to teach others about Him, and to worship His holiness. Let’s not be scared of the idea that God can work in and through music. Well said, and a great bible study! Thank you! Since we’re specifically talking about music in a church service, let me say I have found the music in a service is invaluable in determining the spiritual direction of that church. Most churches I know of have gravitated and sunk into a postmodern worldview. They may not have gone so far as to adopt the moral relativity of the world (some have), but the emotional underpinings of postmodernism are emphasized in the music at those churches. I’m not trying to say that the music is too emotional. I’m trying to point out that the music selection (and often the presentation) seems to *only* address the singers’ emotional state. The songs repeatedly praise God for His grace, mercy, patience, tenderness, love… and those are wonderful. But… there’s something missing. Are we ministering to God at all? Are we willing to praise Him for the less comfortable aspects of His character? He is just. He judges. He chastises. He gives truth and wisdom. He reveals our own lies and foolishness. Our epistemology is distorted, and we need to renew our minds. The music at most churches doesn’t seem to be aiding in that. Rather, it seems to encourage “digging in” and becoming entrenched in a worldview that uses emotions for things they weren’t meant for. When we feel good in singing, we assume we are getting close to God. We also assume God is pleased with us and the words we sing. We let our emotions become the proof of God’s involvement in our lives and in our church service. Emotions are extremely important, but we have to be careful to use them for what they were made for. They shouldn’t replace our reasoning. In our music, they shouldn’t be considered proof of anything, nor should they be the driver for everything. It’s not an easy thing to parse out. Generally, it takes a while to experience the music of a church, but the lopsided nature of it does eventually seem to come through in my opinion. I think that the emotionalized focus even comes out in the fact that the music portion of a service is usually called “worship”. How else do we/should we worship? Is it worship if God doesn’t “feel present”? Thank you so much for your comment! If I’m reading correctly, I think you’re talking about song lyrics more than musical style? In that case, I definitely agree the churches should take a close look at what we’re singing. There’ve been times I was uncomfortable singing some songs because the words either aren’t scripturally sound or they’re extremely repetitive and seem designed to just build up empty emotions. You also bring up a good point about using emotions the way God intends. There’s a fine balance between getting carried away with emotions in a bad way and being so scared of emotions that we shut-down feelings in an unhealthy way. Certainly something we should be careful of!